Dave and I began our artistic journey many years ago. 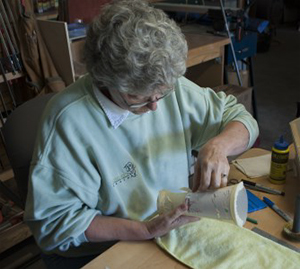 We began with woodworking, added jewelry but then discovered the process of sand carving glass. Exploring this new creative inspiration with vigor we began developing designs, cutting our own stencils and sand blasting each piece individually. The Glass and Jewelry are mediums that offer infinite possibilities for growth and improvement which maintains our creative interest. 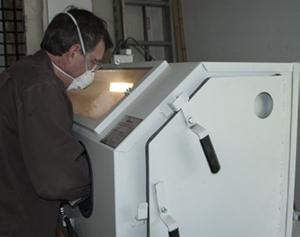 Some more recent designs require up to 14 separate trips to the sand blaster, giving the finished product a unique three dimensional look. Three components keep our work interesting; Dave’s long time carpentry and machinist skills bring a unique symmetry and detail to the designs; Elvy’s artistry and fertile imagination fuel the fire; and, most important, our sense of humor adds an element of fun to all we do. Our artistic pursuits have added to an already wonderful relationship with our work and each other. We like being busy and producing creative works of art to be enjoyed for years to come.